Last month, I took a position as Director of Advanced Analytics at Juice. I'm primarily a machine learning guy, so I will be focused on developing custom algorithms for Juice clients as well as building analytics products for a wider audience. 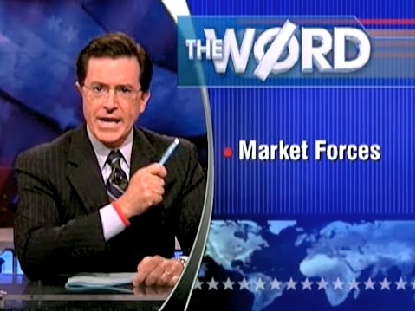 My first idea for post on the Juice blog was to investigate how an appearance on the Colbert Report correlated with Amazon sales rank (we figured political polling data would be too sparse). We investigated a small sample of authors and found some evidence for the Colbert Bump. We know that Colbert isn’t a big fan of “facts”, and only needs his gut to tell him the Colbert Bump is real. At Juice, we let the data decide what’s real or not, so our apologies to Stephen for not taking his word for it. Intrigued, Juice Analytics set out to find out the truth. 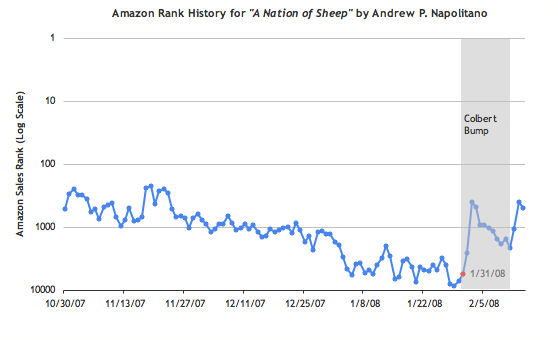 We gathered data about Amazon sales rank for 20 authors that appeared on his show in recent months. How did those ranks change in the days immediately before and after the authors’ appearance on the show? If you are interested in how we estimated sales, Chris Anderson's Amazon Long Tail post was the starting point. You can get ranking data like this using the Amazon Associates web service or from one of several apps built on top of it. One related paper I recommend checking out is "The Dynamics of Book Sales: Endogenous versus Exogenous Shocks in Complex Networks". You can find more references in my Amazon sales del.icio.us links. It’s a shock! Liberals and high-minded egg-heads do better than popular or conservative books. I’m not sure if Colbert knows this, but his audience isn’t who he thinks they are. *The book was released on October 30, 2007 and the Colbert appearance was January 31, 2008. The comparable spike following the Colbert Bump seems to be from a longer appearance of Napolitano on the February 11th Bloomberg Night Talk.